John Mayberry Jr. and Jed Lowrie donate baseball supplies and play a friendly game at an after school program in Managua. Photo by Milessa Lowrie. College teammates and roommates back in the day, big leaguers Jed Lowrie (Oakland Athletics second baseman) and John Mayberry Jr. (retired Philadelphia Phillies outfielder) have always shared a hilarious banter. Although they are adults now with real world responsibilities, Lowrie and Mayberry Jr. still razz each other to no end and prompt everyone around them to get caught up in the laughter. That classic Lowrie/Mayberry Jr. banter was on full display earlier this month in Managua, Nicaragua as the two teamed up to headline several days of baseball clinics and equipment donations organized by the nonprofit, Project Béisbol, with the support of the U.S. Embassy in Managua, the MLB Players Union, and the Nicaraguan Federation of Associated Baseball. Project Béisbol—whose mission is to support baseball and softball programs for disadvantaged populations in areas of Latin America where fandom for baseball runs deep but resources are scarce—organized a 10-day itinerary of clinics that started in the capital and moved to the poorer coastal areas in the east of Nicaragua. When they weren’t giving each other a hard time for being too old, hogging the shaded batting cage area, or butchering a Spanish expression, Lowrie and Mayberry Jr. were hands-on with the kids, providing baseball instruction and connecting with young Nicaraguan athletes and coaches. The participants, age 10 to 18 years old (approximately 35 percent of them girls), represented a diverse background of talent. Regardless of individual skill, Lowrie and Mayberry Jr. noted the passion with which the youth participated in the clinics and wanted to learn. “You can tell baseball is in their blood,” remarked Lowrie. Mayberry Jr. providing hitting instruction at a camp in Ciudad Sandino, Nicaragua. Photo by Milessa Lowrie. The program reached 600 boys and girls and donated over 1,000 pounds of baseball equipment. Billed as “Homerun for Equality” (Home Run por la Igualdad), the clinics not only aimed to provide on-field baseball instruction, but also to address gender equality and gender-based violence through workshops run by local specialists. After circling through instruction in the infield, outfield, hitting and pitching, the kids spent a rotation with a counselor who engaged them in discussions on gender equality and provided them with actionable tools to prevent violence against women. As with many complicated social issues, sport often provides a useful platform to address topics that can be considered taboo in a disarming way. Baseball in Nicaragua is already making headway in including more women in the sport, where female baseball leagues are spreading, and more coaches and team officials are women (though there is a need for greater opportunities for younger girls to play the sport, something Project Béisbol is prioritizing). Lowrie pitches during a friendly game with kids in Managua. Photo by Milessa Lowrie. In addition to formal baseball instruction, Lowrie and Mayberry Jr. answered questions from the kids about their baseball journeys and reinforced themes such as hard work and resilience in pursuing one’s dreams. “One of the things that I would love to reinforce to each kid is that there is no dream that is too big. There are numerous stories of Big League players that have come from adverse situations and reached the highest levels in the sport. 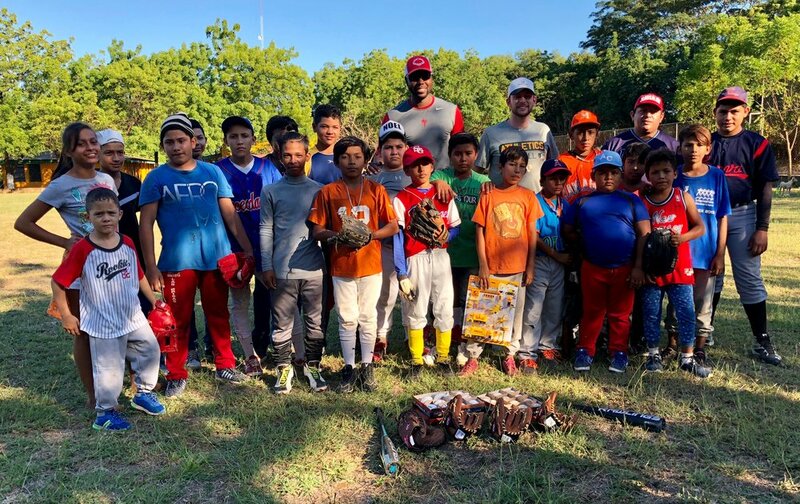 With determination, hard work and preparation, no one can stop you,” said Mayberry Jr.
Project Béisbol donates equipment in Ciudad Sandino, Nicaragua. Photo courtesy of U.S. Embassy in Managua. Given the reaction from the kids, it was clear that engagement through sport can bring hope to communities in need. As Project Béisbol founder Justin Halladay said, “Baseball offers a unique opportunity to unite people, communities and countries through the sport we love. It is a window to new cultures and greater opportunities for kids in regions of Latin America suffering from persistent poverty and violence. Just a bag of supplies or a visit from one of our volunteers or MLB supporters brings hope and can change an entire community.” Whether playing on a well-manicured field at an MLB stadium or on the dirt fields in rural Nicaragua, a common love of baseball, peppered with some silliness and levity from some Big Leaguers (who are really just big kids themselves), can create bonds that transcend language and culture. Lowrie and Mayberry Jr. pose in front of the new Estadio Nacional Dennis Martinez in Managua; Lowrie gifts Ambassador Dogu an Oakland A's jersey. Photos by Milessa Lowrie.